Teenage advice usually deals with personal and social issues, and many of them (in hindsight, at least) seem rather trivial. Who reading this hasn’t experienced the following situations during their teenage years? What’s the best way to get rid of pimples? Is it time to seek out new friends? I love playing sports, but are my extracurricular activities getting in the way of my studies? How can I muster up the courage to ask <insert crush here> to the prom? These things seem absolutely life-altering at the time, but every teenager goes through them. However, there is something that only a few teenagers have to deal with, and it actually is life-altering, in every sense of the word. Note the description above: life-altering, not life-ruining. For San Diego County women, one of the best ways to get assistance is through Turning Point’s Next Steps initiative. 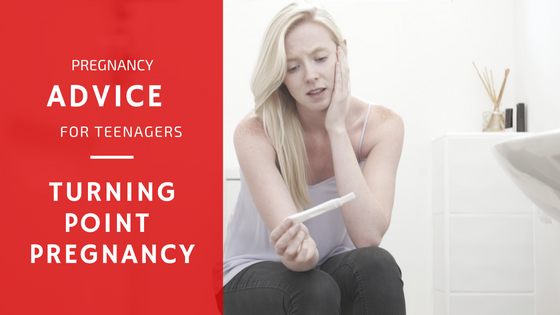 We can support pregnant teenagers and help them juggle the often-conflicting roles of mother and student, and also meet both short and long-term goals – personal and professional! We’ve compiled some of the best advice for teens going through a pregnancy. Healthy teenagers are more susceptible to giving birth to low-weight babies, and smoking only make the problem worse. Keep this in mind: every time you puff a cigarette, your baby does, too. Abortion isn’t the only answer. Too often, pregnant teens view abortion as the only way out. That’s simply not true. Aside from negative physical and mental health consequences, abortion takes the life of an unborn child. From adoption agency referrals to open and honest counseling sessions, Turning Point can show any teenager the extraordinary benefits of giving life a chance! Understand that redemption is within reach. The shame and embarrassment of a teenage pregnancy is enough to send the most personable, well-adjusted young woman into depression. Yet once the initial shock wears off, the stigma of a teenage pregnancy becomes something entirely different. It can transform a young mother for the better. It can produce a loving child. It can be the beginning of an unbreakable family bond. Bottom line: it’s all up to you! If you’re a teenager going through an unplanned pregnancy and don’t know where to get help, Turning Point is a great place to start. Our counselors are willing and ready to assist you today, just like we’ve been doing for women the San Diego County since 2000. Please call us today at 858-397-1970 with any questions or concerns you have. From free pregnancy tests to adoption referrals, we have plenty of solutions to choose from.